Live in Northern California and get directed to Oregon servers on Xbox One. Usually I get a connection of between 16 and 60ms. Today there were/are frequent spikes up to 300-400ms making it impossible to move at times. Third day in a row I can't play. Come on guys, you made a great game here. Don't let it suffer because of bad servers. Its 5am in New Zealand, 3am on the east coast of Australia. There are a grand total of 24 people playing on all three Sydney servers. Yet I get a connection like this. My internet for my PS4 is 23 down, 10 up. There is no one else using the internet right now on any other device, When I started the game I had 28 ping. Please. I want this game to succeed. I want to be able to play what is probably my favourite game of the year. But if the servers don't improve back to how they were at launch I'll just stop playing right now and spend my time playing something else. I have no words. I saw a ping above the 2000 mark (that's 2 thousand! ), in a private match from the looks of it. My ping woes look like first world problems. Did not do this at launch only past 3 weeks. I am also having ping issues (Nov 25th) on Xbox One. I have had the game since launch day and have never had lag issues, typically getting in game pings around 50ms on the Salt Lake or Oregon Data Centers. Today, I am averaging 75-85ms and often breaking over 100ms. Yet even today my ping to the server from the main menu shows 25-30ms like it always has, but once in game the numbers are much worse as I indicated above. Hit detection is a complete mess, and players are rubber banding all over the place. The game is unplayable right now. Make that four days in a row. Killcams entirely different to what I see on my end. Massive skips and lag spikes. My K/D has halved, I can't carry anymore and my team is losing because of this ridiculous lag. I have had 40ms ping +- a few ms to all oregon data centers yet while playing the entire server on PC lags, everyone is complaining about it in every game i play. its constant across all 4 oregon data centers. My friend in BC also lags out while i live in reno NV. so highly doubting its a routing issue. can someone give some kind of an answer about the state of the data centers at this time? Getting lag spikes of up to 10 seconds. With the accompanying rubberbanding etc. The game between the lag spikes has been higher ping now, too, for the last week or so. "connection to server timed out" has also occasionally happened (never happened before) for the last week or so. How much more data do you need to collect Respawn? It's been weeks now, across all datacenters and all platforms. If I were you, I'd look at the lag comp code. Seems to me this mostly happens when someone on a high latency connection joins a game, and the lag comp tries to put them on equal footing with the rest of us, resulting in these ridiculous spikes and red bar demi-gods. Usually getting 60-80 ping but occasionally getting 200-300 ping. How much more data do you need to collect Respawn? It's been weeks now, across all datacenters and all platforms. This so much! Respawn's communication is still "well maybe there is something wrong with your X or one particular datacenter" instead of "our code definitely has a bug". I e put a lot of hours into this, A LOT. I'm getting really tired of the stuttering it's getting worse. I have no idea what data center to use because sometimes the lowest center makes me lag the most, so I choose the next best and it will clean it up occasionally. I use different data centers because each day is a different experience. So I switch. I use 3-4 different data centers. Make that a week of not being able to play without ping spikes past 1000. Tell me about it man. The only days I haven't played have been when I have lent the game to a friend for a day or two. Now I simply can't play multiplayer at all. I really don't know what the problem is. My Internet hasn't changed, the amount of devices connected hasn't changed. My PS4 still runs every other game fine. So it has to be on Respawn's end. 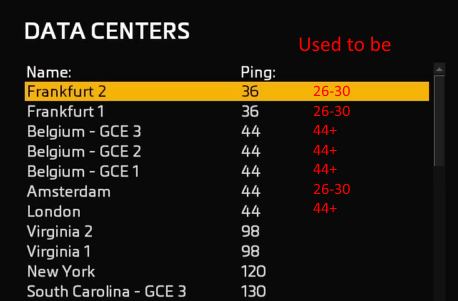 2) The data center automatically connects me to: Frankfurt1 (Ping 77-78, and 110-130 in the game), or to Belgium-GSE1 (Ping 110-130), as you can see dear developers no difference! Play is not possible! Multiplayer has been unplayable for me for nearly a week. 1) I live in southern VA.
2) I use Virginia 1, Virginia 2, New York and South Carolina 1- GCE datacenters. @Respawn - Can we at least expect something done about this with the patch on wednesday? Or is it vain hope?